If you were building your dream home, would you hire just any builder? If you expected to hire the best employee, wouldn’t you check their resume? If you wanted to build a great baseball team, would you sign Joe Smith or Clayton Kershaw? With over 244,000 businesses in Los Angeles County alone, the companies that stand out, the empire-builders, are the ones that hire the true pros. Which is why the best businesses and commercial retailers in Los Angeles choose Mobile Illumination, year after year, to install their Christmas lighting. They choose us because the best companies in Los Angeles know the power of Christmas lighting to create winter wonderlands out of their malls, hotels, city boulevards, and shops. We are the tried and true craftsmen when it comes to Christmas lighting installation and décor. When it comes to installation, we bring attention to the tiniest detail for even the biggest and most difficult jobs. Like lighting a 35-foot Christmas tree at Azalea Shopping Center with 5,000 lights, making sure every single light is installed with care. Like wrapping the 70-foot smokestacks of the Queen Mary with custom lights. Like turning heads in Beverly Hills away from all the glittering celebrities towards Rodeo Drive’s palm trees that were lit up and seemingly went as far as the eye could see. 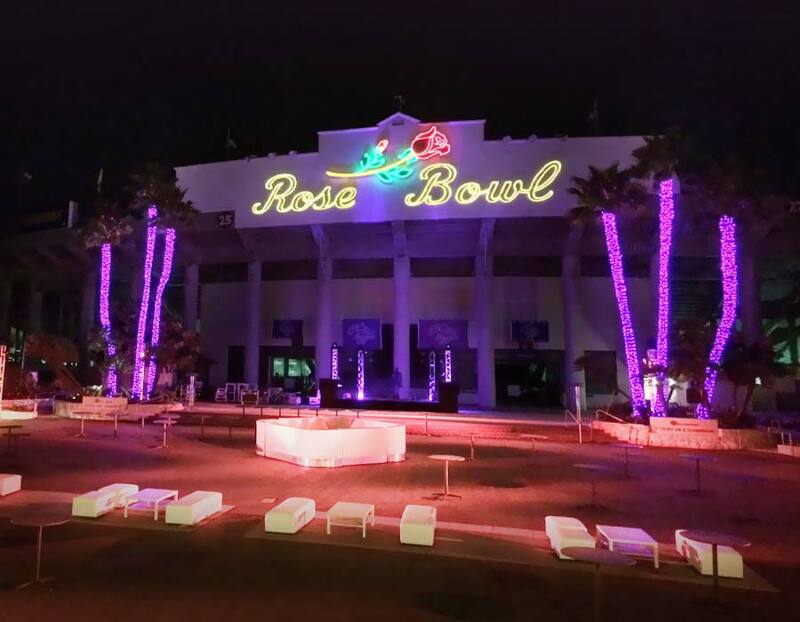 Like installing lights and LED wall washes that covered the Rose Bowl, one of the world’s largest stadiums. All of these jobs are incredibly difficult to install, but we make every installation look easy. We make it look easy, because our Christmas light installation teams are led by Crew Chiefs with 8-15 years of experience. When our teams arrive, they bring with them the security and comfort that can only be guaranteed by the most experienced leadership. We make it look easy, because we bring the best equipment to do the best job. From vans packed with customized tools and lights, to Boom Lifts and Bucket Trucks, we arrive ready for Christmas lighting installation perfection. We make it look easy, because our custom tools, quality equipment, and installation pros not only do the job, but guarantee the safest and worry free installation at your property. All of our work is completely insured, and we bring the added insurance of installation pros trained and equipped to do the best and safest work. We make it convenient for you, because our teams keep your own customers in mind. We work quickly and at night, so our installation teams will never block traffic or get in the way of your business operations or your customer foot traffic. We take great pride in our ability to make Christmas lighting installation look easy and feel hassle free to our clients. Whether its ice rinks, car dealerships, yachts, city streets, shopping malls, and grand hotels, you name it and we’ve done it. This is why cities like Beverly Hills, Burbank, Santa Clarita, and Santa Monica choose us to transform their streets into Christmas lighting destinations. It’s simple. When it comes to Christmas lighting installation in Los Angeles, or the art of creating holiday glow and buzz for any property, the businesses, brands, cities and iconic destinations you know best already choose us, because they know we can handle every job, every time, and with zero hassle. At Mobile Illumination, there is nothing we can’t do and nothing we haven’t done. For over fifteen years, we have provided the best businesses in the Los Angeles area with the best custom Christmas lighting in the industry. 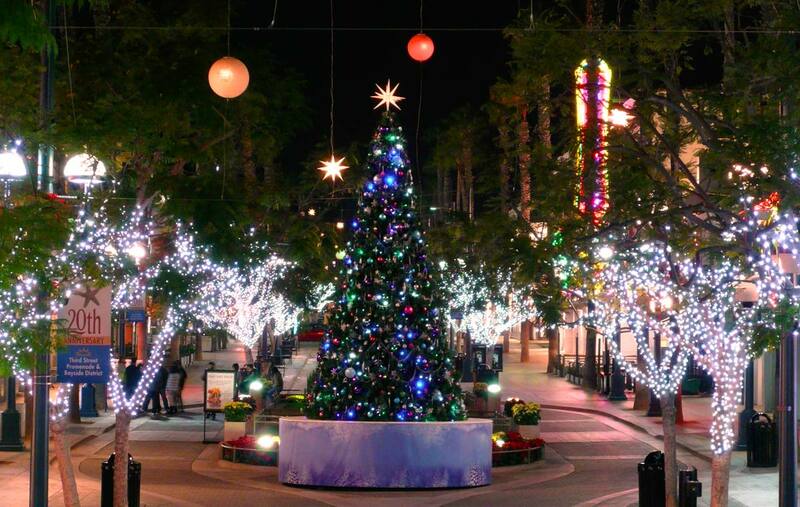 While there may be 244,000 companies in Los Angeles County alone, when it comes to Christmas lighting installation and décor, there is really only one team and one company, Mobile Illumination, with the best Christmas lighting installation resume.